Notes: WEA, Exclusive Steelcase designed by Manta Lab features "Full Glossy" Finish and "Debossed" Title. 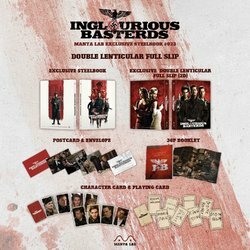 Finally, we are approved with the Inglourious Basterds Manta Lab Exclusive Steelbook. We've been working on this release since last September (not 2018) and took us 1 year to finally get the rights, design and final approval for this movie. It is one of our favorite movies of all time from Tarantino so we hope we've done a good job with the package. We had a plan to start the pre-order for this movie in late October but due to our recent late production and delay with the previous releases, we have decided to put on a hold until we finish all shipping up to The Shape of Water. Thank you very much for your interest in advance and we will release the information soon. OOoooooohh, That's a BINGO! Manta doing Tarantino? Dreams do come true! Good god. Manta are on fire. So in for this. Oh f*** yes! So in!! Amazing news!!! I hope the steelbook got good artwork! 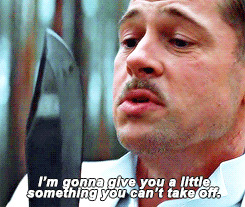 Inglourious Basterds actually got me into movies and still holds a steady spot in my top 10 favourite films of all time.